Steve Eisman, who correctly predicted the collapse of subprime mortgages before the 2008 financial crisis and was subsequently popularized in the move The Big Short, appears to have had a change of heart on the banking sector. Recall that just two months ago, Eisman explained to CNBC that he was bullish on bank stocks, claiming that the financial "industry is so well-capitalized today that I don't see any problems emerging for a very long time ... I sleep very well. I just don't see any systemic risk on the horizon." And while he still believes the "financial system in the US is safe", he is far less optimistic on what is going on abroad. Speaking in an interview with Bloomberg TV, Eisman said that "Deutsche Bank is a problem bank," has "real profitability issues,” and predicted that it will probably have to raise capital next year; he refused to disclose however if he was short shares. 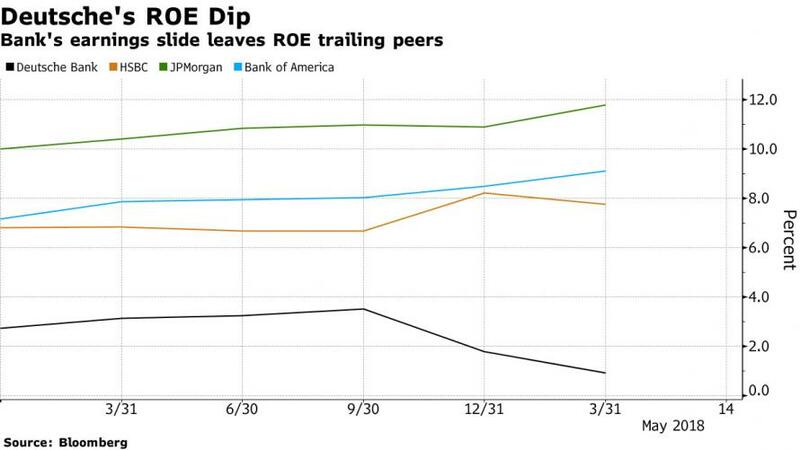 Eisman's bearish turn on Germany's largest bank comes just weeks after DB's new CEO announced that as part of a major restructuring and cost-cutting, the bank would scale back U.S. rates sales and trading, reduce the corporate finance business in the U.S. and Asia and review its global equities business. The measures will lead to a “significant reduction” in the workforce this year. Commenting on this, Eisman said the firm has to "shrink dramatically." The good news is that while Deutsche’s return on equity trails that of its main competitors, the bank’s capital cushion is comparatively strong with a Tier 1 equity capital ratio of 13.4%, above the average among its largest peers. That however has not stopped Deutsche shares from slumping 34% in the past 12 months, the second-worst performance on the MSCI Euro index and far more than the 4.9% decline in the Bloomberg Europe 500 Banks index in the same period. It wasn't just Deutsche however, as Eisman also recommended shorting Canadian financial companies, saying "Canada is ok, but Canada will have some issues with their housing market", and reiterated that he is still short Wells Fargo. Eisman, who was played by Steve Carell in the movie "The Big Short", is most famous for his early bets against the housing market before the 2008 crisis. At the time, Eisman worked at FrontPoint Partners LLC, and joined Neuberger Berman after closing his hedge fund Emrys Partners in 2014. Eisman also said that he doesn’t currently see opportunity in bond market, and predicted that long-short investing is making a comeback as volatility is here to stay; Eisman explicitly refused to comment on the financial situation in China. His Bloomberg interview is below.